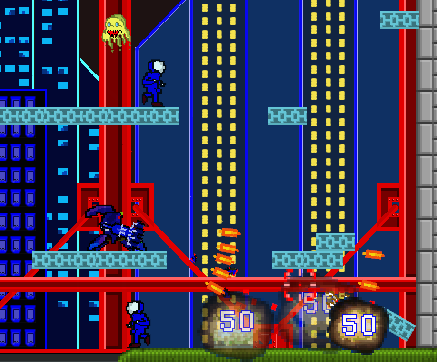 When Tessearact Hyper Gunner developer Rachid Abdul sent over details on their retro-inspired HTML5 Game Tesseract Hyper Gunner, I noticed it had been built on Scirra’s Construct 2 HTML5 Game Builder and asked for his thoughts on the Construct2 platform. What do i think of Construct 2? Fricken awesome thats what i think. Scirra is constantly releasing updates to it (didn’t help me too much lol, but this is still a good thing), and even regularly engages with the users on forum which i think is awesome. Construct 2 has got to be one of the easiest game development tools to use and probably the fastest for anyone to pick up and make a game right away without much effort. “Without knowing much about how it worked and just tinkering with the provided examples, I was able to put together a rough prototype within a matter of days. Matter of fact, Tesseract was literally built off of the platform jump-through example and there’s still bits and pieces from it still in the game right now :). Since we knew from the get go that Tesseract was going to be a fast paced action shooter with many objects moving around at once, my concerned was the rendering speed of HTML5 and if it can handle this type of game. 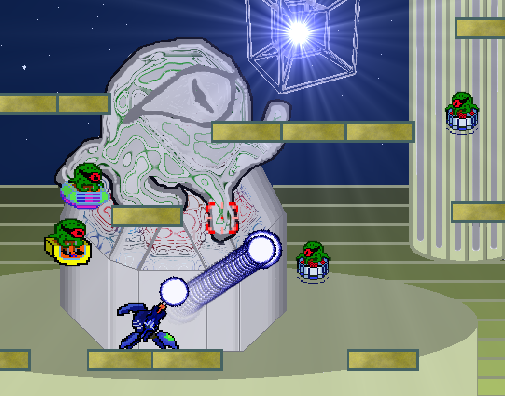 So once again, Construct 2 allowed for Web GL to be used and it made it run great, even on full screen with tons of physics pieces flying all over the place which is quite impressive. It turned out well so we went full steam with the development each night. Jorge did most of the graphics, while i focused on the development itself. Construct 2 had an interesting set of pre-built “behaviors” that you assigned to each game object on screen. This particular aspect saved me *a lot* of time, allowing me to focus on gameplay rather than the mechanics of the game. “Now, while i do have so many praises for Construct 2, its not without its issues. While the editor itself its great, there’s been a few times it randomly crashed on me. Luckily i didn’t lose too much work. But this is typical of many other editors too so i’m not too surprised by it. There is something quirky with the animation system in Construct 2 and i can’t quite figure out what it is. Its the reason why not all the guns in Tesseract are animated like they’re supposed to be. The event-based system of development can definitely save tremendous amount of time, however, about half way through the development cycle i began to noticed a lot of redundancies which i don’t think can be avoided with this type of system. I’m also thinking that i can probably *code* the game (if had a robust layout editor along with it) a lot quicker too had i done this in code that by “dragging and dropping” (note that i said the word *code*, not develop which is two different things). So check out Rachid and Jorge’s Tesseract Hyper Gunner, and, based on Rachid’s feedback it’s certainly worth giving Construct 2 a look.